Meet eight-year-old Genesis. 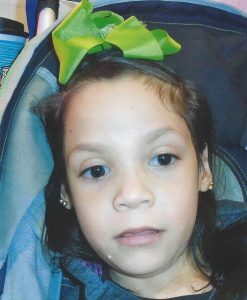 She was diagnosed with cerebral palsy and Periventricular leucomalacia . The latter is a disease that ultimately causes severe brain malformations and lifelong struggles. Genesis tries walking, but she can only take a few steps. Genesis, however, is determined to stand without assistance. Her speaking ability is also limited to approximately 10 words. Genesis is very happy despite these and other challenges. Genesis needs an activity chair with improve support for her body. Currently, she is using a standard high chair that is not appropriate for her age or her needs. Care givers are required to hold her upright while she eats. A new activity chair with a support system will make meal time easier for Genesis and her family. Please be her sponsor! 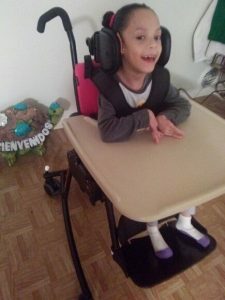 Genesis received her activity chair and couldn’t be happier! This new activity chair provides Genesis with a comfortable and safe alternative seat to her wheelchair. This way she can easily join her family for dinner and fun times at the table. Thanks to the wheels she can easily be moved from room to room without having to transfer!